Soulbound left me rocking in the corner, mumbling incoherently as to how Ms. Tessa Dare could leave me teetering on a precipice, wondering how I’ll ever be able to wait until the second book in the Lone Star Witches series is released. Heartbreak, magic, and murder are at the forefront of this action-packed title. First, I have to mention that the serious cliffhanger-ish ending has me frothing-at-the-mouth for more of this series. I hope we stick with our two main characters from this title, Xandra and Declan, in the next book. I LIKE them. A lot. I love the fact that we’re clued in early on that there’s a big entity that isn’t exactly cool, and – for the record – I totally called the secretive and lurking bad guy at about the 45% mark. With many twists and turns in the plot, however, Ms. Dare had me doubting my super-Ninja prediction skills until nearly the very end of the title. There was a pretty strong cast of supporting characters in this title, making me nervous that the next book won’t be about Xandra and Declan. **sobs** I HAVE to know what happens with them! Led by Nate, a local homicide cop, I felt that this ensemble beautifully represented different aspects of our lives. Donovan, Xandra’s oldest brother, represents the security of our childhood. Even if things don’t appear to be safe and serene, we like to imagine that, with a snap of our fingers order can be restored to our world, and a role model is the perfect way in which to accomplish this. Xandra’s mom, Queen of the Ipswitch clan… Just. Wow. I wonder how she’ll react to certain aspects of Xandra’s life NOW! Selema, the witch whisperer, certainly seemed to be more of a thorn in Xandra’s side than a helpful cast member, but she did propel the plot in her own, eccentric manner. Lily, Xandra’s bestie, nestled seeds of knowledge in Xandra’s head. Something that definitely drove the plot…however, I seriously need to know what happens next for HER, too. Ryder, Declan’s brother, seems to be pretty cool through the title, but I got the heebie-jeebies during one particular scene… There were a few members of the ensemble that made appearances, contributed to furthering the plot, but I’m ambivalent about them… except Trevor. He’s my new bestie! Xandra, our gutsy, strong heroine, seems to be a fabulous model for overcoming adversity. In light of the fact that she’s supposedly unable to practice magic, she seems to make lemonade out of lemons at every turn. I found it interesting that her coffee shop was so popular; almost like she was trying to be in the spotlight for some reason. The success of her business like a beacon directly to her. She’s got so much inner strength that she doesn’t really seem concerned about her own well-being. Even when she was unable to control a situation, she worried more about others than herself. I wonder if it’s because of her connection to Declan that she seems so fearless. Declan, super warlock that he is, seems to be mysteriously in-tune with Xandra and her angst. I love how tender he is with her, even though he has the rough, unapproachable exterior. Like they’re sole-mates or something. I really enjoyed the fact that Declan’s magic played a prominent role, even for the general populace, in the story. I felt that he was extremely willing and eager to protect Xandra in a selfless manner. That endeared Declan to me even more. I have a tendency to root for the underdog in the first place. Yeah, for the most part, I win. It’s nice, especially when there’s someone like Declan that has a really cruddy story to accompany his sardonic, lopsided grin (BTW, I’m over lopsided grins). Watching the plot, expertly woven, change and evolve was an utter delight. 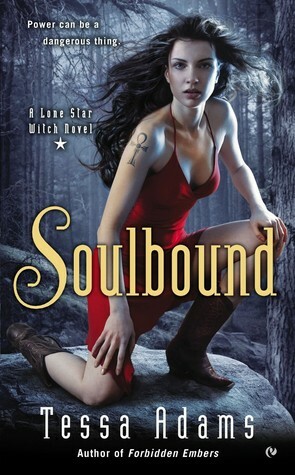 Soulbound should definitely be in your TBR if you’re a fan of witchcraft of any sort, magic, and the dark arts. Shhh. Harry Potter fans may even think this the adult version. We won’t broadcast that too loudly, however. Definitely can’t wait until the next title in the Lone Star Witches series is released!